So we’re not done with the story covers yet, huh? Guess I can accept that. But the sooner we get a ‘Fangs off, Creep’ cover, the happier I’ll be. As you saw on the cover, Dan and his men find a coffin floating in outer space. Naturally they can’t leave well enough alone, and apparently floating coffins fall under the mandate of ‘exploring the lost worlds’. 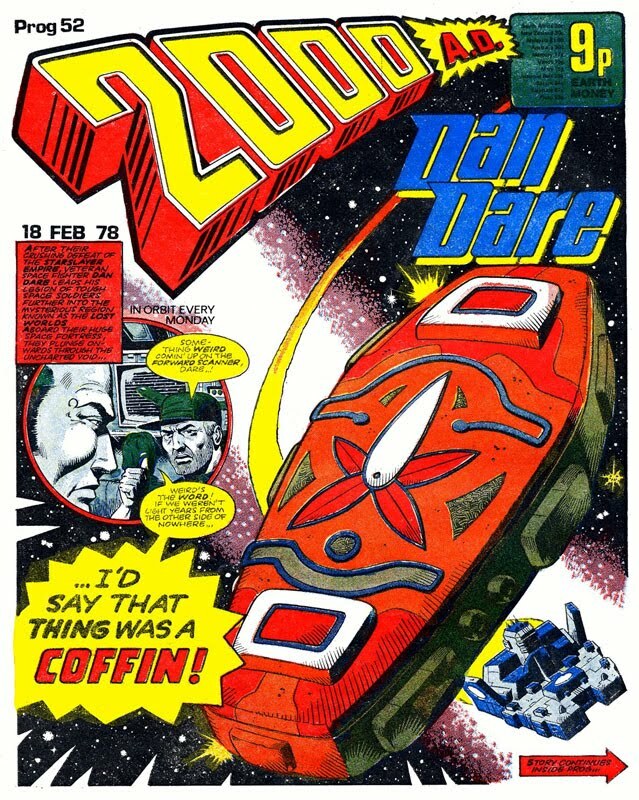 The coffin zaps Dan with a blinding light, and when he awakes in the sick bay, he discovers that the coffin has produced an exact copy of him within itself! Being an evil twin, the clone immediately tackles Dan, and during the fistfight the rest of the crew loses track of which one is which. Things are complicated further when the clone knocks Dan down and announces that he’s the real one. Synchro-bearings? Okay, so Dan flees from the Clone and his own men, then fakes his death by… um… stepping aside when Clone shoots at him. When his pursuers find just a handful of charred fur left by a demolished wall panel, they assume that Dan was atomized, and go on with their business. Leaving Dan to plot a way to prove his identity next week! Unless, of course, this is one of those ‘brainy twist’ stories, where we’re watching form the POV of the clone who’s so perfect that he literally thinks he’s Dan! I’m guessing it’s not that. Well, that wasn’t so bad, now was it? 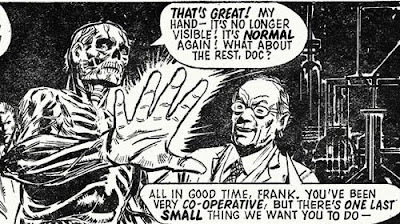 It turns out the ‘special research’ that the evil doctor Burnard had in mind for Frank was space-related. We find him, as this episode opens, being spun around in a centrifuge, Moonraker-style. It seems that, with space travel being all the rage these days, they need to find out the effects of takeoff and weightlessness on the human body – and what better way to do that than by simply filming a visible man while it’s happening! There is a cure, after all! 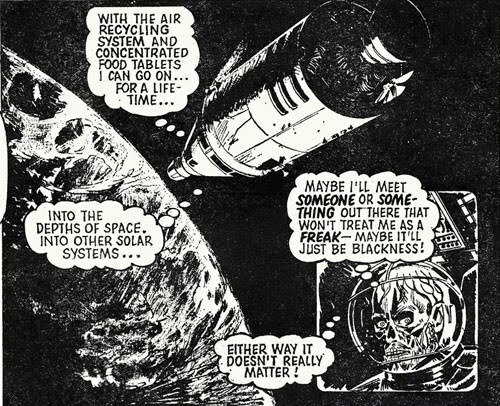 So Frank is blasted into space, where he goes through a few tests, then asks to be returned home. It’s then that doctor Burnard makes his fatal mistake – he tells Frank that they have a whole other series of tests lined up for his return! 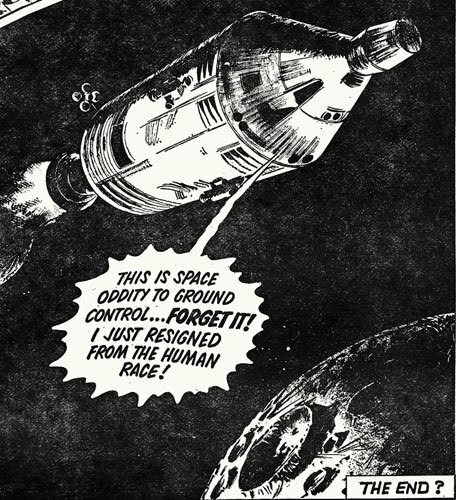 Frank reacts in the only logical fashion available to him – by blasting his capsule into deep space! Where he’ll no doubt die – or will he? Check out Frank’s bizarre reasoning. Okay, now overlooking the fact that it’s extremely doubtful that, when launching a single man into space they’d include a ‘lifetime supply’ of food tablets, as well as just how long the batteries operating the air recycler will last, what key element of survival has Frank forgotten about here? That’s right – water. Look forwards to those three days in space, buddy. But somehow I don’t see a return from our favorite novelty model-kit inspired freak in the offing. At least any time soon. 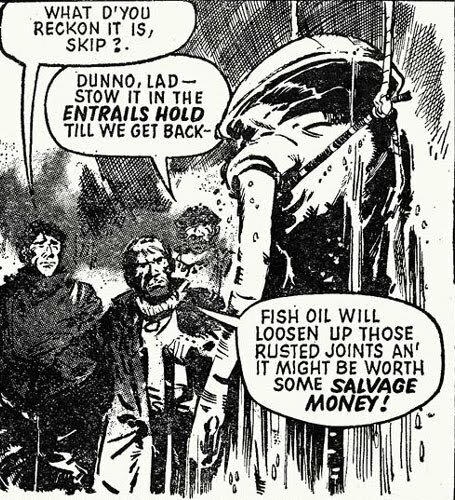 The ship goes dark just minutes after this moment – as does the submarine that finds it floating derelict three weeks later! 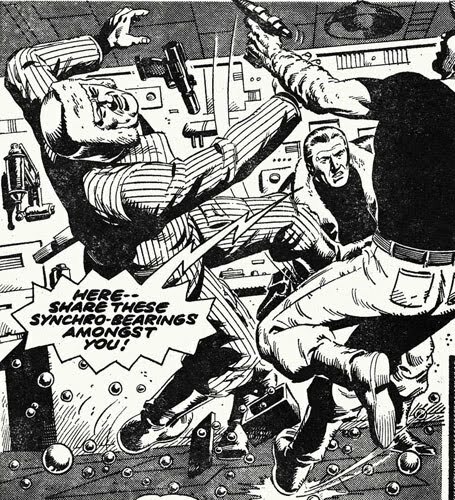 Although this time we see a little of the action, as the robot/alien/thing uses eyebeams to blow up the seamen! We’re finally introduced to the story’s presumable hero when Naval Intelligence commander James Hunter – he’s dispatched to solve the mystery of the missing ships! He boards the empty trawler and finds no sign of the missing fishermen – then proceeds to the last registered fishing site that the ship worked. Their sonar picks up a mass near the ocean floor – when they pull it up they discover that it’s an escape pod… likely from an alien spacecraft! How can they know this? The professor investigating the ship for the government finds a symbol on its side from a ten-thousand year old South American civilization! Hunter is skeptical, but I’m guessing we’re in for some more chariots of the gods! Then disappear among the hostages being let out of the bank! In a happy coincidence the judges don’t bother searching hostages as they flee the bank, so the crooks are able to escape with the money and their face-changing kit! 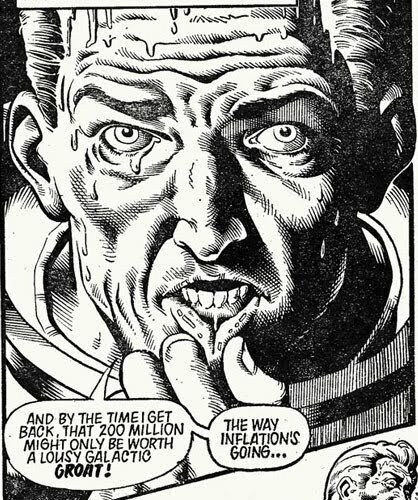 Dredd figures out why the faces were familiar a little too late (who knew he was a fan of B/W comedy flicks? )- but he’s got a lead: they must have obtained their face changing kit from somewhere, right? Seriously? Three hours in front of hot lights? And they get a lawyer? What the hell kind of a police state is this? Oh, and here’s their lawyer, who confirms that the celebrity faces are pretty clearly being drawn with a lightbox and a photo of Rondo Hatton – not that I’m judging. 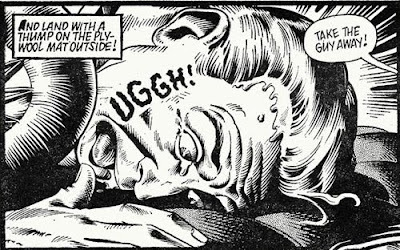 I’d be a fool to criticize Bolland’s faces, after all. 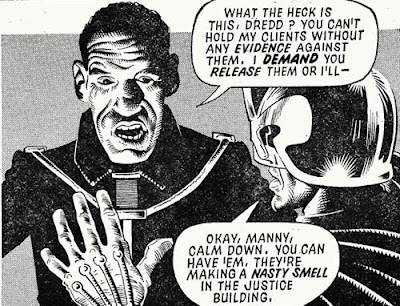 After springing his clients the lawyer hangs around to give Judge Dredd a piece of his mind, leading to a great scene of yell-spitting. 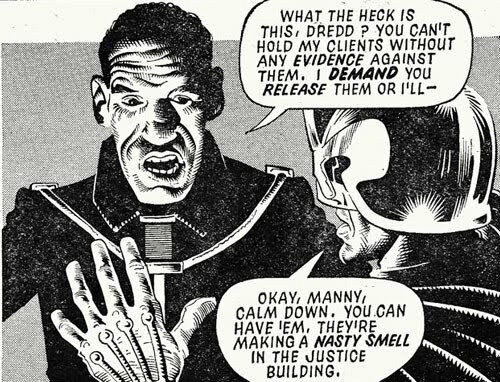 Dude, he’s not afraid of Judge Dredd at all. Is that weird, or is it just me? Soon after the lawyer heads out of justice central and rides with the crooks back to their hideout, where they explain the details of their next planned heist to him. Only it’s not him at all! Dredd used to shoot a guy and then make a pun. Now he punches a guy and then really makes him think hard about the choices in his life that have brought him to this point. I can’t say that’s an improvement. Also not an improvement? The first piece of bad Brian Bolland art I’ve encountered. What’s going on here? He’s holding the gun while also opening his jacket? 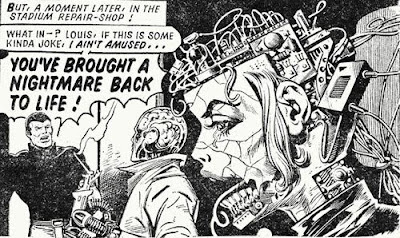 How does that work – and where did the other cable from the Lawyer’s futuristic epaulet/tie combo go? Why must all our heroes have feet of clay? 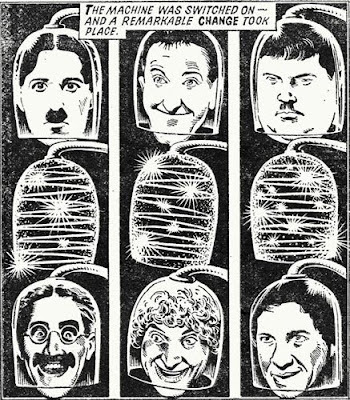 Oh my god – two Bolland stories in one Prog? I must be dreaming – also, I promise to go easy on the art this time. It seems that in the future shipping goods out to the rim of human space is big business, and it’s been almost completely automated! Just one human pilot is sent on the ship on an extremely lucrative run. One problem? It’s three years out, and three years back – could even 200 million dollars be worth that kind of stress? It was just a simulator! Which the pilot only spent ten seconds inside before going mad! Although that doesn’t really jibe with the events as presented so far- We saw the guy pacing around and talking to himself, as well as climb out of the cockpit and look out a window. Who knows, maybe they were using some kind of time compression matrix to simulate a month on the ship? Anyhoo, it was a fun twist, and fantastic art. Hasn’t been a lot to report out of the nerve centre lately, but I enjoyed this page because a kid finally asked what happens to the comic’s title when we get to the year 2000… We now know that the answer, as with Conan O’Brien’s sketch and 20th century Fox’s logo, is that nothing changed. At the time, however, Tharg responded with a surprising lack of omniscience, admitting that they had no idea what would happen if the thing ran that long. He even asks kids if they’d be interested in a ‘tale of 3000AD’ being included in a future issue. I have no idea what that could possibly mean – after all, the only strip in this comic actually set around the year 2000, Invasion 1999, just ended last issue. The rest are set in the 21st century and beyond. Maybe we’ll find out soon – although, like the continuing adventures of the Visible Man, I don’t hold out a lot of hope for that. 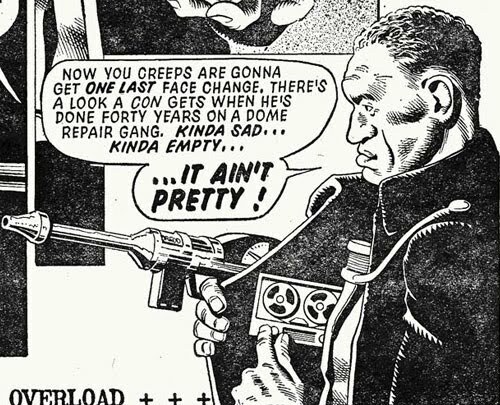 Regal Eegle, the world’s greatest biker, has shown up at the stadium for a try-out, but his haughty airs cause him to immediately clash with the rest of the team – especially Moody Bloo, the cave-man who’d brought his midget brother to the stadium that day to try out as a flier. Before hurt feelings can escalate into a full-on fight Giant convinces Regal to show off his skills. He proves to be everything advertised, and, other than a suspicious unwillingness to ride the ‘Death Wall’ that rings the pitch at a nearly vertical angle, there are no qualms about letting him onto the team. Yup, he re-built the robobabe. This can only end well. Three from Bolland? Whatever I did to deserve this, I’ve got to do more of it. Hey, remember when last week they announced that this time Walter’s brother would be showing up? Yeah, that kind of killed the mystery that they were getting at this week. You see, even though Walt’s spent the whole day peacefully at home ‘Iwoning', there’s vid-footage of him robbing a bank! How could this be? Ah, right, his twin brother, from the promo last week. Not that we find that out this time around. No, this particular story ends with Walter going on the lam, puzzled as to how he’s been identified as a criminal. Sigh. Why do ads have to ruin things? First Shako, and now this? Fie on them, I say! Best Story: Judge Dredd - If only for the wonderful drawing of Oliver Hardy blasting someone with a laz-rifle. 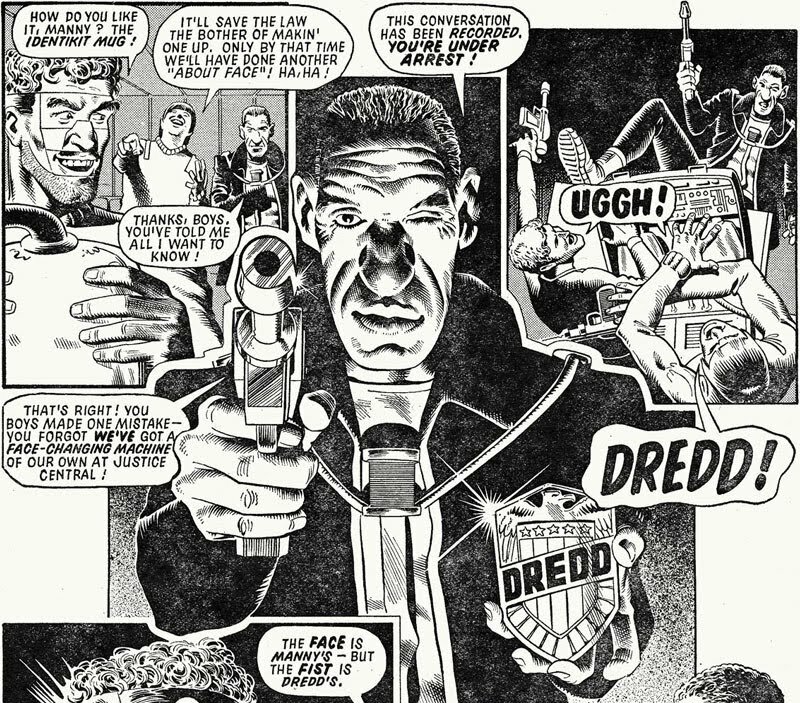 Also, technically speaking, this may the only time (I know of, at least) that Dredd is depicted without his helmet. But it's not actually his face, so like the censored block and all the off-panel stuff, I don't think it really counts. Worst Story: Visible Man – Anticlimacism has never been my bag, man, and this wasn’t any kind of a satisfying wrap-up for the series.